WAV vs. MP3 – what are these formats and which one to pick for everyday use? MP3 is the most popular audio file format, but how does it differ from WAV? Digital music has captured the entire world, with two main file standards – MP3 vs. WAV – but what do these words stand for, what are the pros and cons of each? "MP3 vs. WAV" are both used in all music areas, from portable audio players to video game soundtracks and more. The apparently universal nature of both formats suggests that these formats are completely interchangeable. However, there are profound differences between them, many of which I'm going to explain. Here, I'll focus on exactly the difference between WAV and MP3 in a bit more detail. WAV is an uncompressed format – this means the recording is reproduced without any loss in audio quality. WAV is a simple format – files are fairly easy to process and edit. WAV allows us to listen to the highest recording rates with tremendous dynamic ranges (up to 192 kHz). All this has made WAV an excellent format to work with studio records, mastering, and advanced audio applications. WAV files are large. To compare, a CD recording (44.1 kHz, 16-bit) is ~30 MB on average, while standard WAV can take up to 500 MB. WAVs are impractical for portable devices or streaming due to the files size. That is the main reason why streaming services always pick MP3s when they make a WAV vs. MP3 choice. MP3 has successfully carried out a revolution in the world of music. It's the most popular and most common digital audio format. Although many think it's quite modern, its roots go back to the 70s. Unlike WAV, MP3 is a compressed and lossy format. It means that converting any audio to MP3 will reduce its original quality and also reduce the size. The reduction in size and quality results from data being thrown away. There are usually some frequencies that most people can't hear, so this data removed first. Secondly, some sounds are naturally loud, and they usually mask some quieter sounds. This always makes MP3 get rid of some 'hidden' sounds. Lastly, sound compression exploits that human ear hears particular frequencies better than others. Once MP3 decided what data to keep, it's compressed again with more common compression techniques. This is then that the file's size is reduced, and most of the quality is irreversibly lost. I can't say MP3 is that bad, though. MP3 files are of small size. They can be effortlessly distributed over the Internet, and big music libraries stored on computers or music clouds. That is the main reason why MP3 has become a standard for purchasing music. The overall sound quality is usually OK for most average listeners. Using poor headphones or built-in phone speakers, you're likely to hear no difference at all. Converting WAV to MP3 is simple (but terrible). Taking this into account, it's clear why MP3 is a great format for distributing, streaming and promoting music. However, this comes at some cost. Compressing a file causes quality loss. Compression can often result in strange audio artifacts that damage the audio quality, especially higher frequencies. MP3 is not suitable for mastering, mixing and recording. Lots of DJs use only the quality higher than 320 kbps to make sure all the tiniest sounds are clear to their listeners. But what if you want to enjoy Hi-Res sound every day, but iTunes doesn't support all Hi-Res formats? This player is a total game-changer in the world of audio players. Minimalistic design, easy-to-use interface, and a powerful sound engine provide the playback of the highest efficiency and quality. VOX supports most audio formats, from lossy (MP3, OFF, AAC, etc.) to Hi-Res aka lossless like WAV, FLAC, APE, ALAC lots of which aren't supported by Apple's native audio player. 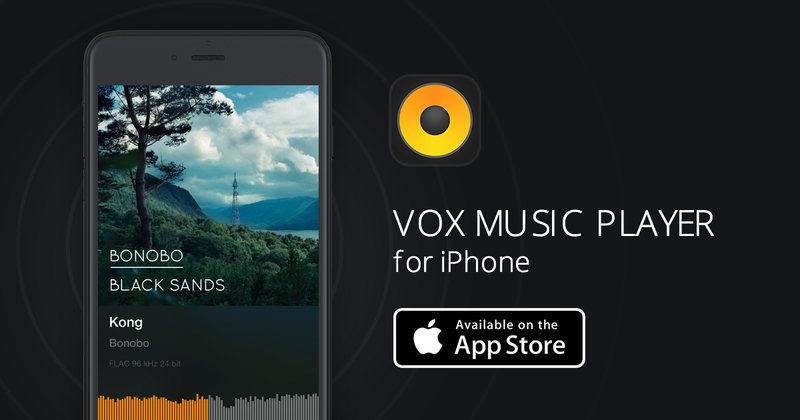 VOX is currently available for Mac & iPhone (and iPod). VOX for iPad currently being under development. Lossy and lossless audio formats playback. Spotify and SoundCloud synchronization. Listen to all your playlist with one app. Mac & iPhone sync collections, so whatever you have, you have on both devices. Customizable EQ with many presets. Access to more than 30,000 radio station. To store your music, there's a special locker called VOX Music Cloud Storage (formerly LOOP Unlimited Music Cloud Storage). VOX Cloud is an unlimited cloud available to VOX users exclusively which stores all your music regardless of the format, size or bit rate. It means that the cloud preserves the original sound and doesn't compress or convert anything. In other words, you listen to what you upload. Sign in forVOX Premium account, upload some music via the web or drop files into VOX Cloud section in VOX Player and everything you have there automatically appears on your iPhone. This eliminates the need to use external HDDs, NAS or poor quality files. It's an excellent music solution for all music lovers. No format or size restrictions. Sync across Mac & iPhone. VOX are an excellent choice if your music library is more than 50 GB and you like to enjoy Hi-Res music. If you're not sure whether to use a cloud to store music, you can read my article which explains why you should already be using a music locker to store your music﻿. In the battle of WAV vs. MP3, there are no champs or underdogs. Both of them have advantages and disadvantages, both of them have strong armies of followers too. We think that one has to listen to both first and make a decision for himself. But don’t forget, this is a free world, no one will blame you if you continue listening to files in both formats.